What is Brown Rock Salt? What is White De-icing Salt? 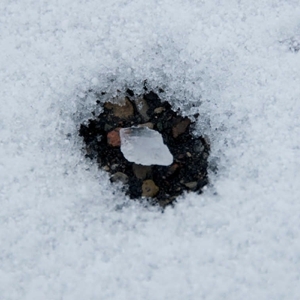 We all know that when frost is forecast, or after you’ve cleared away snow, you put down rock salt, also known as grit salt, or de-icing salt, to melt the ice. How does rock salt work? - It is, in fact, a simple function of chemistry and physics, and particularly, the nature of water. You probably already know that water freezes at zero degrees Celsius or centigrade. And you probably also know that salt dissolves in water. If you didn’t, go away and test it with a beaker of water and a spoonful of table salt until you’re confident about it! But what you may not have known is that the freezing point of water changes when you add other substances to it. So when you add salt to water, effectively, its chemical nature changes. Instead of being pure water, it becomes a salt solution. And a salt solution freezes at a lower temperature than water, up to about five degrees lower. This may sound a rather abstract point, but what it means in practice is that when you put salt down on your paths, driveways and other outside areas, it mixes with the water that is already lying on the ground from dew and rain, and also the water in the air as it condenses onto the ground. This forms a salt solution. The temperature then has to fall a lot lower to freeze the salt solution than if the salt had not been there, to about minus six to eight degrees, rather than zero degrees. This simple science also explains why it is much more effective to put salt down in advance of a freeze, rather than putting it onto ice once it has formed. When you put salt down onto ice, you have to wait for the temperature to rise above zero degrees before there is enough water to make a salt solution. Once some of the ice has thawed, and some of the salt has dissolved, it will not freeze again until the temperature falls considerably further, but you do have to wait until it warms up in the first place. Having said that, if you’re using rock salt, it does make the icy surface easier to grip and walk on anyway, simply by adding a more gritty texture. So it’s well worth adding rock salt or grit salt to an icy surface to make it easier to walk on, and to prevent it freezing further when the temperature drops again later in the day and overnight. So before the next heavy frost or snow is forecast, get onto your rock salt suppliers, and make sure you have a good supply of rock salt ready to keep your paths and driveway safe.